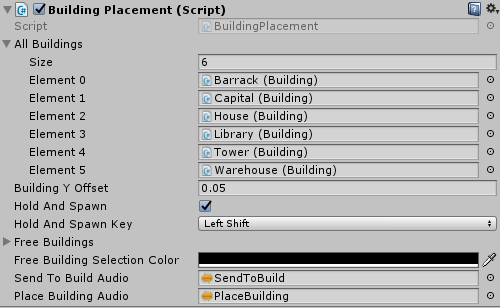 The Building Placement component handles placing buildings for the player controlled faction. When you’re creating a new map using the RTS Engine menu, this component is attached to an object called “BuildingsManager”. All Buildings: A list that holds all the buildings prefabs that the player’s faction can build. If there are buildings that are faction-specific, do not include them in this list. They will be automatically added if they are defined correctly in the Game Manager. Building Y Offset: This value will be added to the building’s position on the y axis when it is placed on the map. Hold And Spawn: If activated, this will allow the player to keep placing the same building over and over while holding the Hold And Spawn Key. Free Buildings: All buildings that have “Free Building” enabled must be in this list. Free Building Selection Color: When a selection a building that does not belong to any faction, this is the color of the selection texture. Send To Build Audio: Audio clip played when the player sends a unit to build a building. Place Building Audio: Audio clip played when the player places a building. The same object holding this component also has the Building Manager component which includes methods used by building-related component. However, it doesn’t have any fields to set.